A black Wii U console with a Wii U GamePad. The Wii U is the eighth generation Nintendo console and is the console where the Splatoon series made its debut starting with Splatoon. The console was followed by the Nintendo Switch on 3 March 2017. The Wii U system, like the handheld Nintendo DS and 3DS systems, comes with a second screen, known as the GamePad in the Wii U's case. One of its main features is its large touch screen, through which some games can be played on the GamePad alone. 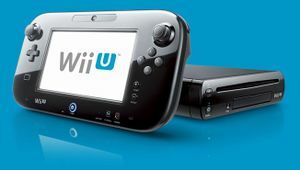 The Wii U offers backwards compatibility with Wii games, and has a service known as Nintendo eShop, where digital versions of games can be purchased. These, along with Splatoon, include some classic Nintendo titles, which are played on the Virtual Console. Also check this article for additional references. This page was last edited on 22 February 2019, at 11:46.